When planning a special event like a wedding, it is important to pay particular attention to the small details. The suit hire shop that you choose should be able to help you find the proper suits for the men in the party, but there are some questions that you may have about your suit hire. When Should Suits Be Ordered for a Wedding? 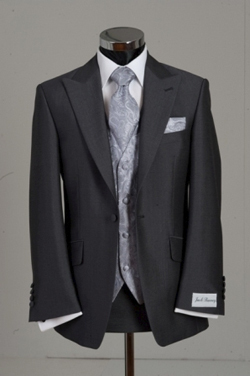 It is recommended that all wedding parties order their suit hire at least four months in advance. Most weddings take a year or more to plan so make sure that the suit hire is near the top of the list in your overall plan. This ensures that your suits will arrive to the shop on time and that there is plenty of opportunity for fittings and alterations if they are necessary. There are some times of the year that are busier for weddings than others and a great advance time will make sure that your chosen suit will be available for your wedding date. Should Accessories and Shoes Be Included in the Outfit From the Suit Hire Shop? Choosing the accessories and shoes from the suit hire shop ensures that everyone in the wedding party has exactly the same items. One member of the party with a different pair of shoes can ruin the effect that you are going for. Matching accessories such as cufflinks adds a bit of polish to the wedding that would be missed if everyone is wearing different accessories. When Should the Suit be tried on? The suit should be tried on the day it is brought home from the suit hire shop. It is never a good idea to wait till the day of the wedding to try on the clothing. Make sure that you give plenty of time to the store to make any changes to the suit that is needed. Should the Wedding Party Be Fitted for Suits at the Same Time? It isn’t necessary for everyone to be fitted at the same time, but it is a good idea to make sure that everyone gets into the shop for a fitting within a specific time frame. This ensures that there are no hold outs or delays in getting the suits ready for the wedding. How Are Suits Paid For? Most suit hire shops will require an initial deposit on the day of the order with the balance paid on pickup. Each suit hire shop will have its own rules regarding payment and the types of payment that are accepted. Check with the shop to be sure that you understand how payment is made and when. Most suit hire shops do charge a late fee when the suit or garment is returned to the shop late. Check with the particular shop you are using to find out the policy on late charges. Some shops can charge a hefty fee for returning the garment late. These are just a few of the suit hire FAQs that you might have. Be sure to make a list of your questions and bring it to the shop with you before placing your order.